Located on near the east boundary of Garibaldi Provincial Park, on the divide between Tuwasus and Billygoat creeks. This is the easternmost portion of the McBride Range. Access is via logging roads that run up from the Lillooet River. 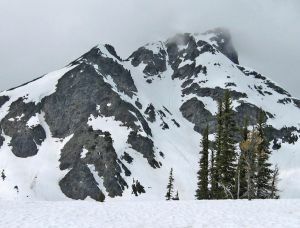 Gain a northeast-pointing ridge and follow it to the southwest side of this peak. The south-southeast ridge is a pleasant scramble. Name Notes: This peak is unlabelled on the 1:50K maps. As of 2009.01.02, we have assigned the name "Flood Peak" to this peak, after Flood Creek.